When the evil Tehran Friday prayer leader, Ahmad Khatami, demanded in his sermon that the harshest methods be used against the detained protesters so that others would become aware of consequences of opposing the Islamic establishment, it was just a matter of time before the first execution sentence would be announced. 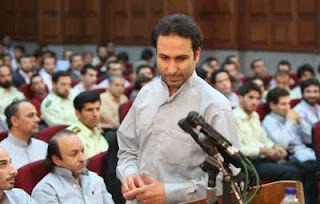 Mohammad Reza Ali Zamani, 37, is the first to be sentenced to death. He is said to be a member of the Iran Monarchy Association. I am no fan of this exile group, if you have followed my blog, you would know what I think about the group and its lunatic leader, Manoucher Fooladvand, whose followers claim he was killed as he crossed borders to Iran but others say he has retired to Spain. Defending the accused on these show trials is not about whether you see eye to eye with the political views of the accused, for this masquerade can not even be called a trial, its a show confession, it is an affront to basic human values. We have no idea about what is going on other than the coup administration has physically and mentally put our fellow countrymen under inhumane pressures to make public confessions, so that the messianic junta can promote their warped justifications of keeping Iranians in captivity. I wrote previously about others like Behzad Nabavi and Mohammad Malekiand some commented that I should not write about these people because they were part and parcel of the regime at some stage. Who they were and what they did is not the issue here, even if in the future Ahamdinejad is put on such show confessions, I will defend him. A Kangaroo court is no place for justice. This is exactly the mistake our previous generation made. When they summarily executed the Shah's military men and officials in their kangaroo courts after the 1979 Islamic revolution, those who were not in favour of the monarchy didn't show much concern, then when they went for the MeK, others who didn't support the MeK didn't show much concern, and so they went for the Communists and those who were not Communists didn't show much concern and then they went for the nationalists and the religious minorities and the trade unionists and before we knew, we were all in it with no one left to defend us. The news of Ali Zamani's death sentence is a test for the coup and a test for us. As Mohsen Sazegara correctly mentioned in his daily video today, we are all united against the coup. The regime often dips its toes first and tests the water, it wants to test the world's reaction, if we stay silent because Ali Zamani is not one of us, there will be many more. You are right on point here. A prisoner of conscience is a prisoner of conscience. We can't remain silent and let anyone be executed for their political affiliations. This would be a failure on the part of the freedom movement.